We offer consulting services at no cost to our customers. 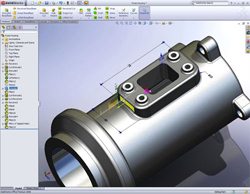 Using the latest Engineering software, we can help design your products to be more manufacture friendly. Aftermarket parts can be reversed engineered & manufactured easily at RTI/JIT. Consulting with us for tooling from sheet metal parts to machined & ground tooling might make your product less expensive. We offer a considerable array of services for manufacturing and we are adding capability every year. It costs you nothing to give us a call or e-mail us a print. You'll be glad you did. If you have parts of any kind you need manufactured, we can assist with the drawing and design process, taking the hassle out of it. Is there older machinery that you can no longer get parts for? Reverse engineering and part duplication are not a problem. Below are links to two free drawing viewers. You can use these to view, measure geometry and print drawing files. We can review your new product ideas in a confidential manner to look at many categories of design including functionality, ergonomics, manufacturing feasibility, cost of tooling/manufacturing. We can also work with a patent attorney of your choice or suggest some for you to keep your product protected. No matter where you are in the design process we can help you from start to finish in preparing your product for market. Let us take your ideas from sketches to finish product!